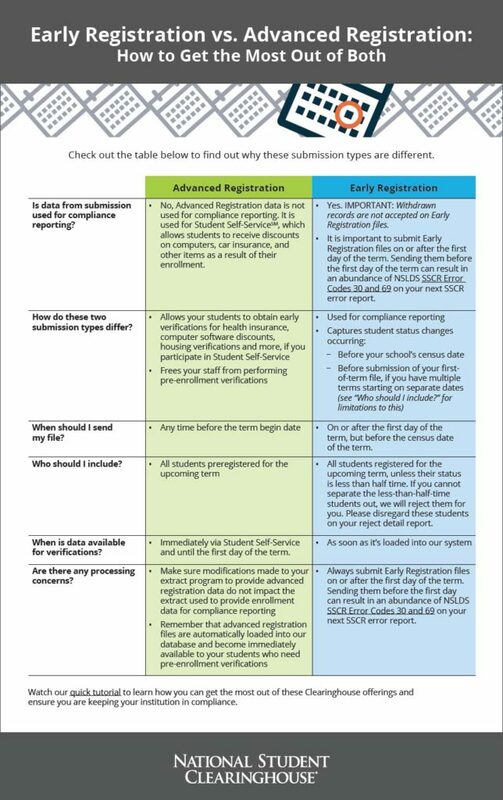 Do you know the difference between advanced registration and early registration data? Early registration offers the ability to provide enrollment data for a term, prior to the census date. Submitting early registration data allows you to get that information to lenders as quickly as possible and help your eligible students obtain or maintain their deferrable status. Advanced registration captures students who have pre-registered for the upcoming term. It is used by institutions that participate in our free Student Self-Service to enable their students obtain pre-enrollment verifications online. Our tutorial, “Difference Between Early and Advanced Registration,” will also walk you through how the two file submissions differ. To sign up for free Student Self-Service, contact your Clearinghouse representative.